In my last post I mentioned that I had gotten together with a few local bloggers a while back to work on a project, so today I’m sharing the details of that with you. The project we worked on was a fall/winter lookbook where we each styled key pieces and trends for fall and winter. I was assigned the sports luxe trend and was only too happy to know that I would get to style my Nikes outside the gym (but to be real I have not yet worn them to the gym). They’re my “fashion sneakers” I got for the sole purpose of styling looks like this one. I’ll let you know when I decide to actually be active and sweat in them, but don’t hold your breath. Sports luxe has been a re-occurring trend for a while now. I may be wrong, but I think the trend made its first appearance in 2013. I remember seeing bloggers everywhere rocking sneakers in unconventional ways, like with dresses and skirts. Or styling jerseys, mesh athletic tops and “fancy” jogging/sweat pants. I wasn’t too into the trend until I started incorporating a couple of elements into some of my looks and got really into it. I think it’s a really fun trend and one that you can easily incorporate into your own style, that adds a real “cool girl” vibe. Also it’s kinda perfect for fall/winter because hello sweat pants, beanies, sneakers, bomber jackets, athletic tops and I’ll stop there, you get the picture, this trend is all about comfort! 1. 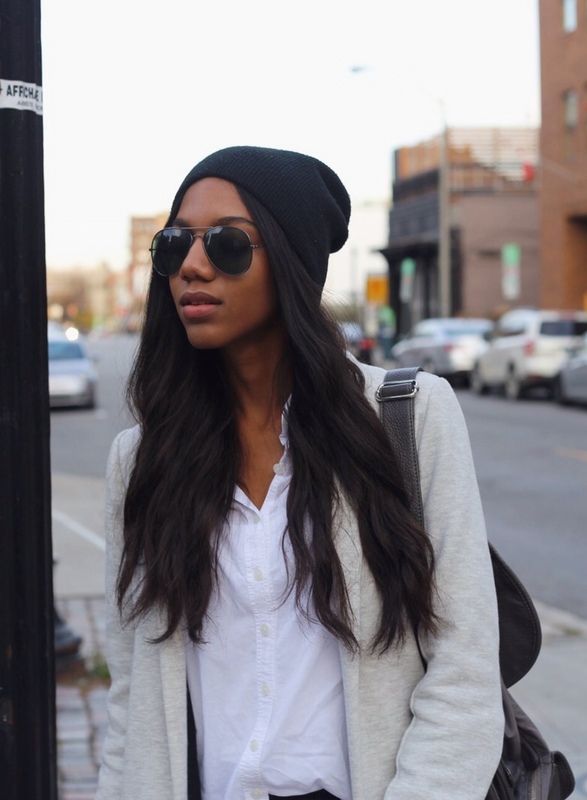 A beanie is a super easy way to add a cool sporty touch to any outfit (and to keep warm). If you’re not a fan of the beanie…ummm explain yourself!? But you can also opt for a baseball hat, that also does the trick. 2. 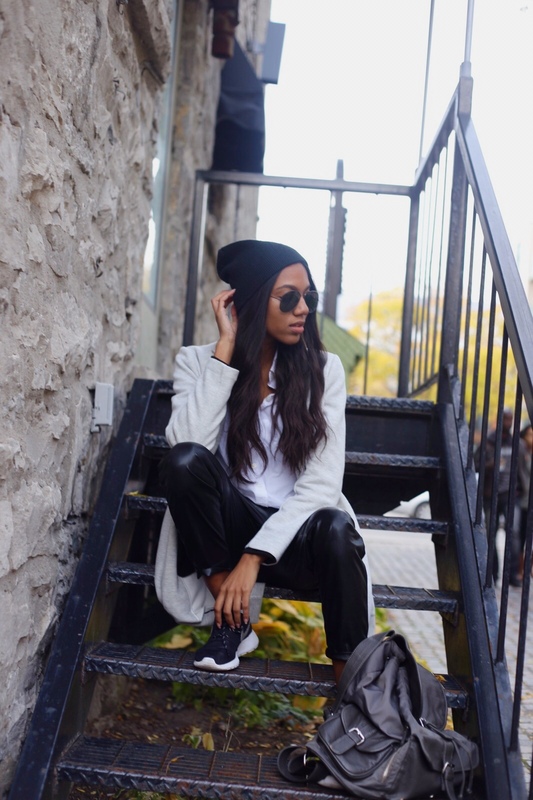 Sneakers are a really easy way to inject this trend into your outfits. I went with my Nike Roshes in black and white because I also felt like keeping a monochrome pallette would help make this look more chic. But you can definitely rock some colourful ones, I’ve seen that done and it looks great. 3. Along with sneakers, I think joggers are the easiest and most essential pieces to have in order to pull of this trend. These leather ones are awesome! They add the sport luxe feel, but since they’re leather they elevate the look and add to our chic level. 4. I think adding a blazer coat is also a great idea for these kinds of looks. They can pull the look together and add structure making the outfit less frumpy. So what do you think? Will you be trying out this trend? Also check out @awalkinottawa on Instagram to see the other looks and trends styled by the other ladies that took part in the lookbook. And thank you to Hawa for getting all of us involved in this great project! First off- you look perfect in these pictures. Second- I was going to challenge you to “dress the blogger” a.k.a moi in “Sport Luxe” without making me look like a vagabond fitness clown. This look is tough to pull off when you are curvy. Wow thanks Chantal! You’re going to give me a big head lol. O MY GOSHHH, I can’t breath!!! A Vagabond fitness clown??? I’m cryingg! Challenge accepted! You can totaly pull off sport luxe curvy or not. I think it’s the joggers that might be putting you off. You could switch those out for a fitted pencil skirt and I think it would look just as good!